Eating out with food allergies | What's New in 'free from' at lunch Show? What's New in 'free from' at lunch Show? My best discovery at the lunch show www.lunchshow.co.uk (the trade show for the ‘food to go’ sector) was Freaks of Nature www.freaksofnature.co.uk . 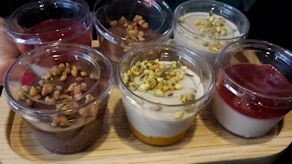 These are delicious puddings, made from fruit, nuts, coconut and cacao. Crucially they are gluten free, dairy free and free from soya and artificial additives, packaged in 90g twin, single and 45g mini pots. I have to say my favourite was Cocoa Loco, a chocolate ganache made with coconut milk and a special blend of cashew cream, sweetened with date syrup and topped with hazelnuts, but they all taste great! It’s always challenging to find a dessert that is gluten free and dairy free, but this one ticks all the boxes. 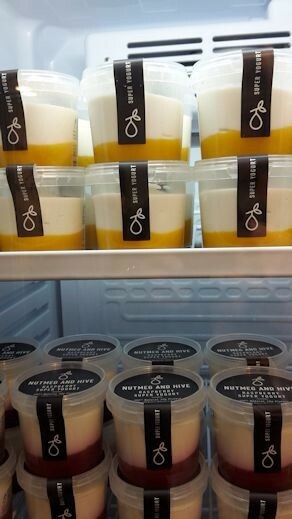 Apparently Peter Ahye, the founder of the company, spent 12 months in the development kitchen coming up with these goodies. They were launched at the show, so we’ll have to wait to see where we can buy them. So watch this space. 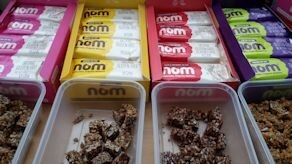 nom www.nomfoods.co.uk produces a range of bars which are gluten free, vegan, dairy free, with no refined sugars. 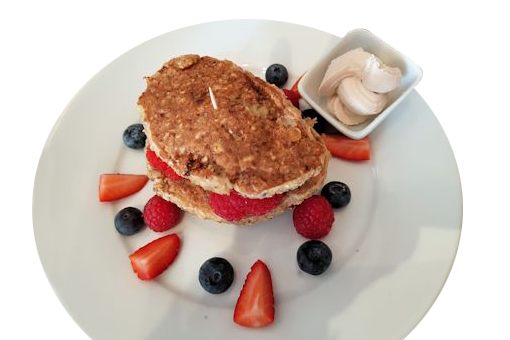 Steph Croft-Simon, founder of the company, who is gluten and dairy free, wanted to make free from foods which appealed to everyone, not just those with a food allergy, so she started making nom bars at home. Now they can be found in stockists, such as Planet Organic and Holland & Barrett, although you can order direct from the web site. Varieties include banana and cacao and raspberry. There’s also a range of popcorn, in flavours such as Cinnamon Maple and Tomato Pesto, also gluten free and dairy free. Another great discovery was the new gluten free and dairy free ice cream from Booja Booja www.boojabooja.com . I particularly liked the Chocolate Salted Caramel, although there are plenty of other flavours including Hazelnut Truffle and Raspberry Ripple. Its range of truffles (also gluten and dairy free) are delicious especially Hazelnut Crunch. See the web site for stockists. How about a marshmallow bar? That’s what I discovered at the Mallow & Marsh www.mallowandmarsh.com stand. 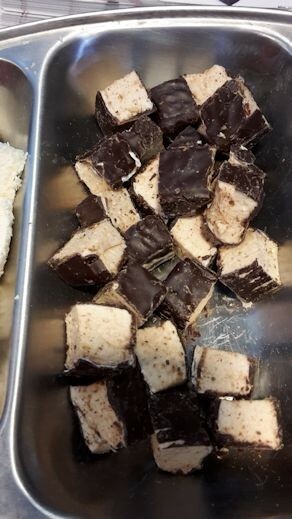 There are several varieties (all gluten free) including coconut marshmallow bar; raspberry, coated in 70% dark chocolate. Stockists, which include Sainsbury’s, are on the web site, although you can buy directly online. Nutmeg and Hive www.nutmegandhive.com was displaying its new range of gluten free super yogurts, packed in mini pots, comprising a layer of fruit at the bottom, yogurt and blossom honey. Three varieties – blueberry, mango and passionfruit and raspberry. Rebecca Rayner, who runs Glebe Farm www.glebefarmfoods.co.uk with her brother, was showcasing her range of gluten free bread, muffins and cake mixes which she has developed. Cake mixes include chocolate, carrot and ginger, as well as cranberry and blueberry muffin mix. 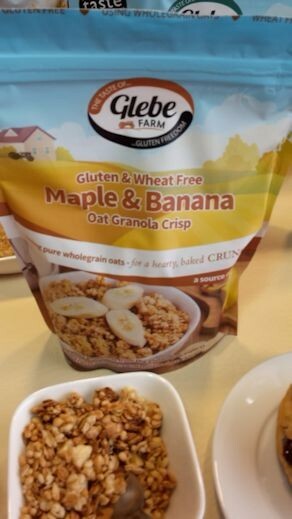 Breakfast cereals include gluten free oats, muesli and granola crisp. Glebe Farm’s gluten free bread and rolls can be found in all National Trust cafés. Available online or see the web site for stockists.